Donaghadee lifeboat was out on a training exercise when they were requested at 7.45 pm to go to the scene of a collision at the mouth of Belfast Lough, between the inbound Liverpool-Belfast Stena Feronia passenger ferry and a 87 metre general cargo ship, the Union Moon. 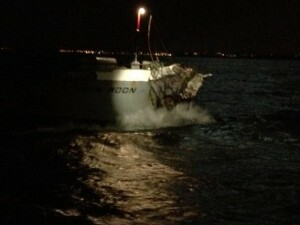 The Union Moon which was leaving Belfast harbour and carrying stone bound for Dagenham was badly damaged above the water line. The Stena ferry sustainedsome damage but was able to dock and all passengers were discharged safely. The lifeboat stood by the Union Moon with pumping equipment while the damage was assessed before escorting the vessel back into harbour. The lifeboat returned to Donaghadee shortly before midnight.